We recommend that every homeowner take advantage of our aeration, compost and over seeding program in the fall. Who doesn’t want a green healthy lawn? Grass grows and develops best in the cool months. Typically this is done between August 25th and September 30th. This allows plenty of time for the grass to germinate and develop prior to going dormant in mid November. An aeration treatment removes small cores of soil and thatch to allow air, moisture and nutrients to penetrate down to the root zone. The cores brought to the surface contain microorganisms, which help the breakdown of the woody thatch tissue layer just below the lawn's crown. As the thatch layer is broken down, it is converted into organic matter that will then combine with existing soil particles. 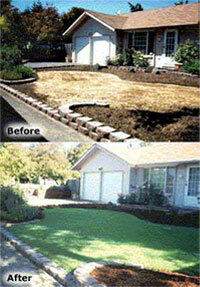 We cross aerate (two directions) your lawn to insure maximum coverage. The cores will breakdown over a period of several weeks. Once the aeration is complete we use a blend of the newest and best certified fescues available in the market today. Seed is applied at a rate of 6-8lbs per thousand square feet. We then apply a ¼ - ½ inch compost allowing the holes to fill in with a mixture of organic matter and soil, The filled hole allows roots of existing grass plants to spread out and grow deeper, creating a healthier, thicker lawn. Try something new? 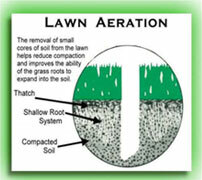 Call and ask about our early spring compost and aeration treatments.